In his program notes to his second Criss Cross album, After Life master tenor saxophonist Noah Preminger writes that, as per the title, the seven original songs on the date "pertain to a world that we may inhabit when we leave Earth." 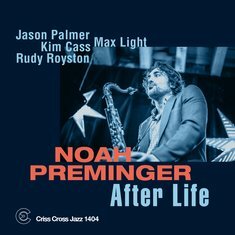 Returning from its Criss Cross predecessor, Genuinity (Criss 1397), are the brilliant trumpeter Jason Palmer and bass virtuoso Kim Cass; modern drum giant Rudy Royston propels the flow, while guitarist Max Light, on his Criss Cross debut, contributes beautifully textured comping and inspired, thematic solos. The album booklet includes a suite of poems by Ruth Lepson, each one inspired by the music.